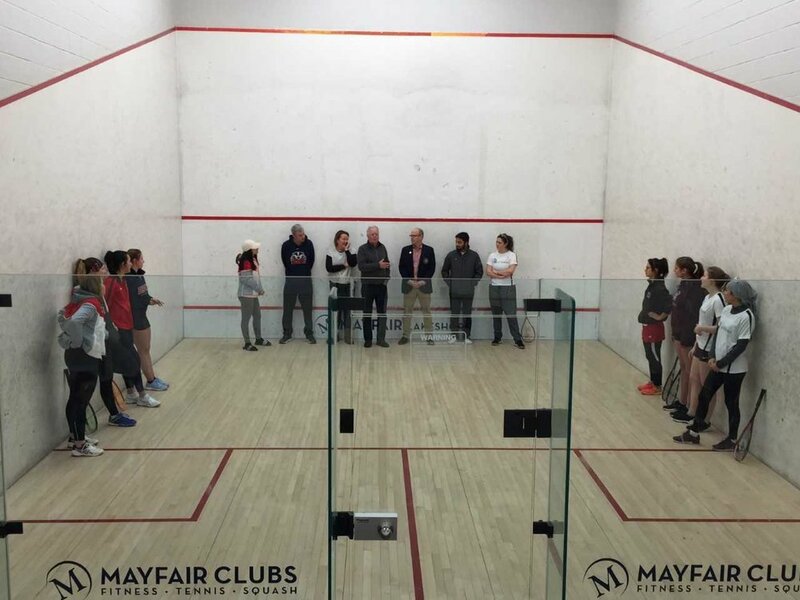 Mayfair Lakeshore in Toronto was at full capacity last weekend while hosting the massive Jesters University Squash Crossover #2. The event took place over two days and hosted over 150 athletes with 21 teams from 11 different Canadian universities. Spirits were very high as teams faced up against the remainder of yet-to-be-played teams from the entire season in this crossover between divisions. In typical Jesters fashion, each match began with comradery and sportsmanship displays that are inherent to this league. Ontario Jesters Chairman, Bert Keene, fellow Jesters Tim Mallory, Jerome Trail, and Michelle Craig and Squash Ontario Executive Director Jamie Nicholls welcomed the athletes and conducted each round of team introductions. Fellow Jesters Clive Porter, Josh Ginou, Holly Delavigne, Matt Easingwood and Vinit Kudva played dual roles at the tournament, each cheering for the schools they coach at while also representing the Jesters and playing an integral role in administering the league. 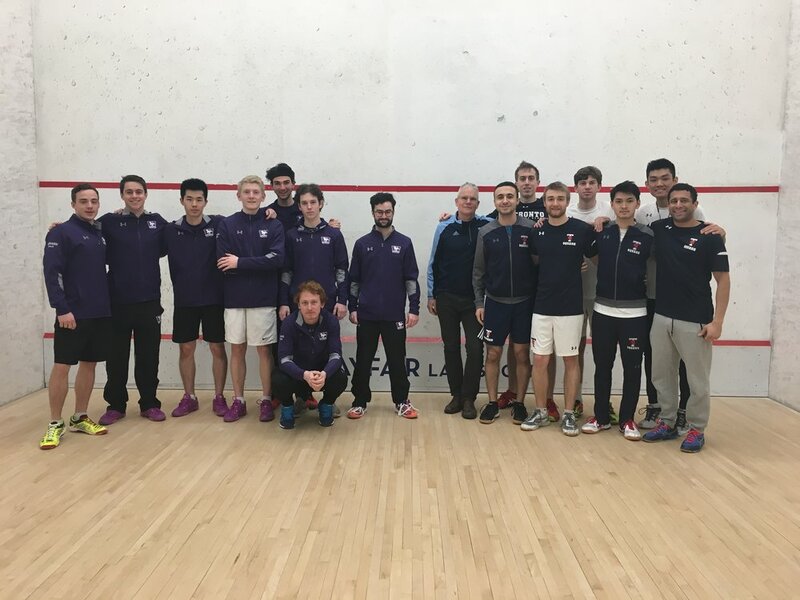 In the men’s division, powerhouse schools Western University and the University of Toronto finally had a chance to see how they stacked up against each other. Both teams entered the tournament undefeated in the season, both just one team match away from winning the Jesters University League 2018-2019 Championship and banner. The match started out with two decisive wins for the University of Toronto by Ambrose Chu in position 7 and Henry Pope in position 4. The next set of matches finished just moments apart from each other. Vicrum Vaidya (U of T position 6) took the match win over Western’s Richard Johansen, winning 11-9 in the fourth. Moments later, an intense position three match ended 13-11 in the 5th, with Matt Lau of U of T besting a strong Duncan Grace of Western. The title was decided – U of T had the 4-0 lead that guaranteed them the gold medal. A strong finish by the top of Toronto’s lineup gave them the 7-0 sweep over Western University in the final; a result that no one was expecting! The teams will match up again at the Ontario University Championships, hosted by White Oaks Resort and Spa February 8th to 10th. In the women’s division, Queen’s University debuted their full line-up for the first time all season. 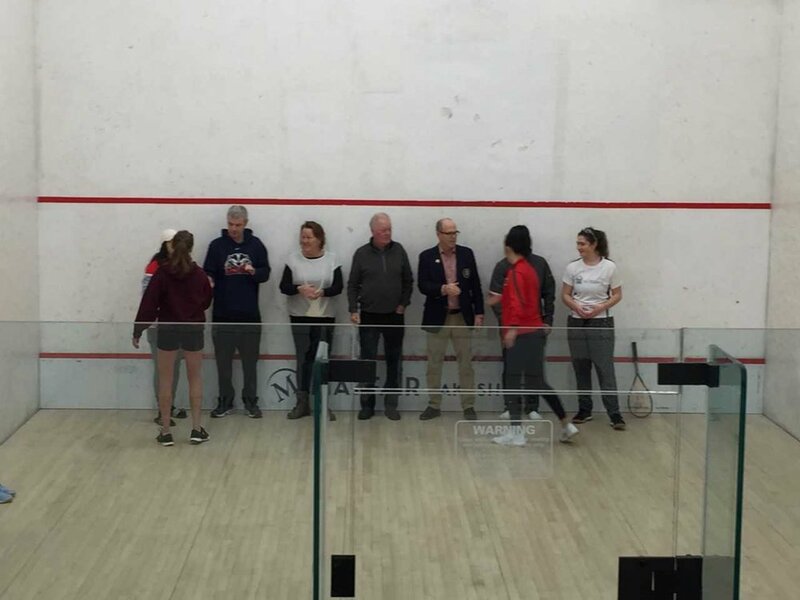 The team, comprised primarily of league rookies, showed an impressive display of squash with such a strong group of players that Queen’s University is no doubt proud to have to represent their institution. 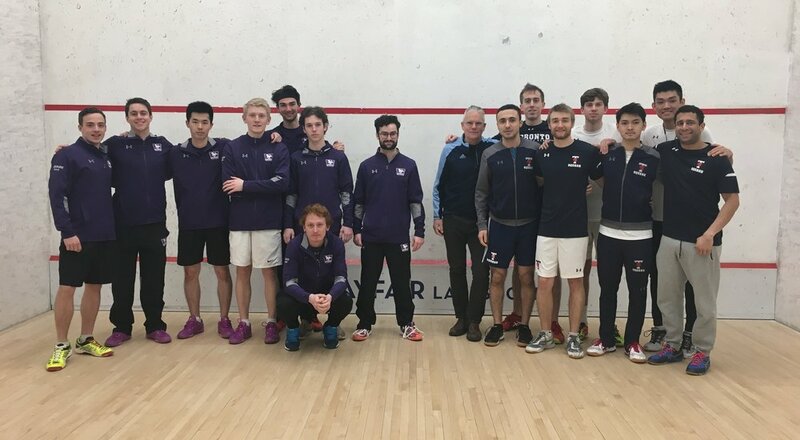 The west division leader, Western University, entered the final match against Queen’s hopeful for the upset against the 3-time reigning OUA champions. However, from the onset of the match, Western was unable to put out the flame that the Queen’s women had ignited. Western fought hard to stay alive but ultimately were defeated 7-0 by the insurmountable Queen’s team of Sydney Maxwell, Amelia Knapp, Heather Mclachlan, Emily Richmond, Danica Deverill, Jordan Mclachlan, and Fiona Ross. At the OUA championship in two weeks, Sydney Maxwell and Amelia Knapp of Queen’s and Catherine Giachino of Western will all be top contenders for both the OUA Rookie of the Year Award and the OUA Player of the Year Award. Having gold and silver positions determined in the top division of the Jesters University League, it is time to look forward to crowning the Division 2 and emerging teams champions for the year. McGill, Ottawa, Laurier, and Guelph women will all be competing for the title next Saturday, February 2nd, at the Div 2/Emerging Teams Jesters University League Finals at Ten X Toronto. For the men’s title, McGill, Ottawa, Glendon, and Laurier will be competing alongside the emerging teams division of Windsor, Carleton, and Ryerson universities. 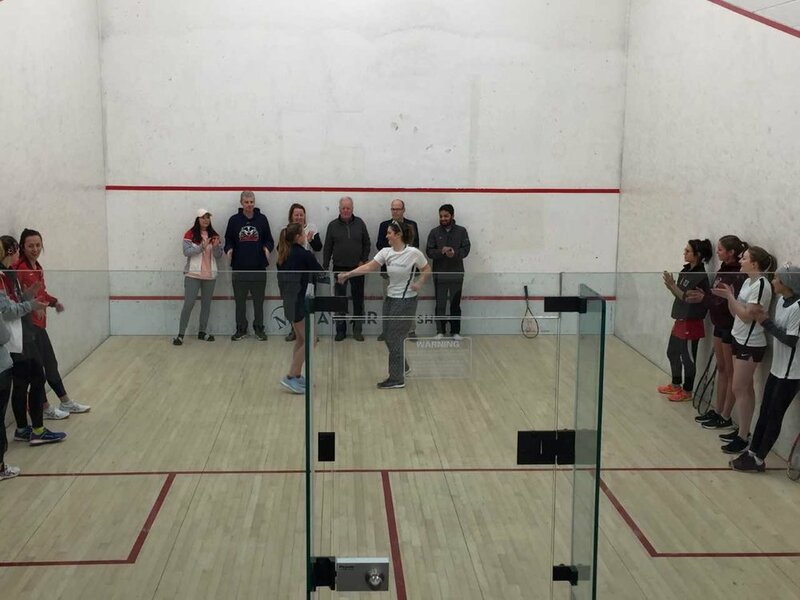 On the Women’s side, McGill, Ottawa, Laurier, Guelph and Windsor will feature four brand new teams to the league, showing the rapid growth of women’s squash at the University level. For the Division 1 schools, the next stop is the Ontario University Athletics Championships, February 8th – 10th at White Oaks Resort and Spa. Reigning champions, Queen’s women and Western men will attempt to defend their titles, in an event that is unparalleled in intensity. Seven universities will be represented, each vying for the all-coveted OUA banner to display proudly above their university squash courts. Follow the action online or come check out the battle in person.